If you’d like to get involved with our work but can’t make a regular volunteering commitment then a National Trust working holiday could be for you. A concentrated burst of path working goodness, you’ll spend a week with experienced Fix the Fells staff learning the techniques and methods that help us protect our delicate upland landscapes. You’ll gain real hands on experience of these methods by working on one of our current projects, leaving with a sense of pride of the stretch of path you’ve helped to look after. 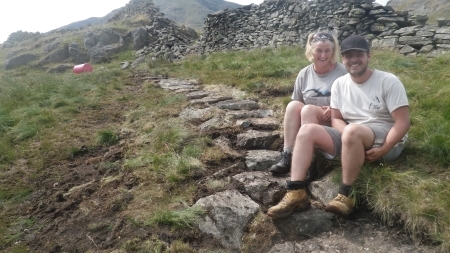 After all this building, you’ll spend the last day out with the Fix the Fells volunteers on a ‘drain run’ and find out about the work that goes into looking after the paths after they’re built. You’ll be out in all weathers but will return to our comfortable bunkhouse accommodation with time to relax for the evening and have a free day to yourself in the middle of the week. At the bunkhouse, under the guidance of a holiday leader, everyone mucks in with the cooking and housekeeping. 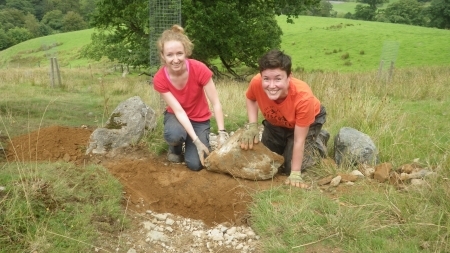 As well as learning about Fix the Fells, a working holiday is also a great way to make new friends! You don’t have to be superman (or woman) to join in with one of these weeks, but you do need a good level of fitness as there can be quite a lot of walking involved and the work can be strenuous. If you like the sound of this and would like to try your hand at Fixing the Fells then follow this link to the National Trust’s working holiday website to book on – See you on the fells!